The Accelerated Achievement Academy (AAA) is Koba’s high school program, located on-site at our Mansion at Focus Point group homes. AAA draws upon technology and incentivized learning to re-energize students who have struggled or failed in traditional academic environments. Intimidated by their educational deficiencies accumulated over many years and fearful of having those shortcomings exposed to their peers, many of our students have a history of actively trying to be suspended from school – usually by acting out behaviorally. They lack the self-confidence and the knowledge base to excel in the classroom or to handle the social dimensions of today’s high school. By the time they enter the AAA, our students have all taken the next step and dropped out of public school altogether. Many have no intention of returning. Yet, through the AAA’s awards and monetary incentives, these residents have found the motivation they need to complete their high school studies, receive their diplomas, and go on to a better “Next Step” – community college, the military, or a vocational program. 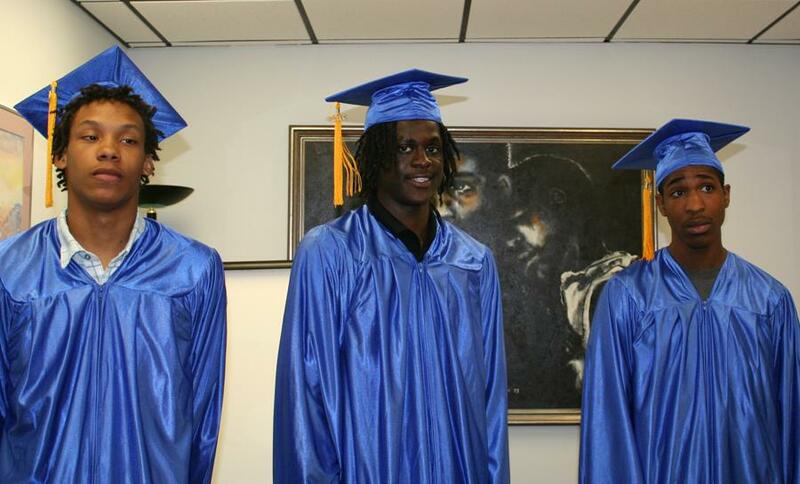 The mission of the AAA is to provide a viable diploma alternative for residents who have dropped out of high school. Education is made available using state-of-the-art computer-based instruction coupled with tutorial assistance. The AAA places a high value on the development of real world skills. Residents who take part in the AAA learn problem-solving skills and enhance their academic aptitude, all while receiving supervision and therapeutic support. Over time, we found that, while our educational resources were of superb quality and were extremely helpful to students who engaged with them, years of poor academic performance and lack of motivation – the same factors that led them to drop out of school – hindered most of our students from making full use of the available resources. After experimenting with numerous motivation strategies, we settled on a basic time-tested solution. Many students in traditional home environments are offered allowances and incentive-based rewards in return for academic successes. Why not intertwine this incentive-based strategy with our academic curriculum? Our approach was to integrate monetary incentives with a time-tested curriculum to maximize motivation. The results were phenomenal. First, the curriculum structure was explained. Students were informed that each subject would comprise a “unit” which would contain a group of up to 10 “lessons.” At the end of each lesson there would be a quiz and at the end of each unit there would be a larger test. For each lesson test passed with a student would receive one dollar and for each unit test passed, they would receive from $10 to $25 based on the test (higher for algebra and geometry) and the passing score. Although students were reluctant when we began to use this “Earn to Learn” model, a dramatic change in attitude occurred in no time. The lure of “cash money” initially dispensed at the end of each day was enough to get even the most lethargic residents working at a pace and with an intensity we had never observed before. Indeed, it was routine for students to skip lunch so they could complete more lessons and earn more money. The incentivized-education model cured the majority of the motivational and behavioral problems that had been their pattern in previous academic settings. The students were so enthralled by the prospect of earning money that they had no patience for negative behaviors or distractions from other residents. Conversations about video games and popular music were replaced by conversations about computer components and sentence structure. As they strove to earn money, our students began to discover their own academic aptitude. As they found that they were able to achieve results, their excitement grew. They came to believe in their own abilities: they COULD overcome the deficiencies that they had previously built up through years of falling behind. From an “Earn to Learn” attitude they transitioned into “Learn to earn” where improving their skills became as important as – and in fact more important than – earning the cash rewards. Although the AAA program has not been without incident, staff members remain within earshot of the students as they continue to improve upon their weaknesses and strengthen the areas where they are already strong. Through our innovative study approach and incentivized curriculum, the Accelerated Achievement Academy has succeeded in opening a doorway to educational success for students who had given up. The AAA also offers a GED study program for students who choose not to follow the alternative diploma track or who determine, after starting the alternative diploma program, that the GED would suit their needs and goals better. STAR assessments are used to measure students’ reading level and math skills when they enter the AAA. Knowing this information helps us to customize the curriculum and instructional materials we use for each student. taken the pre-test, he or she then begins at a manageable level and covers topics in math, reading, and science. These topics are organized around lessons, explanations, and assessment questions. Mastering the topics covered in Study Island helps students gain confidence when taking the Maryland School Assessment (MSA) and High School Assessment (HSA). Lifetime Learning Library is a comprehensive curriculum that is designed to cover grades 6 through 12, as well as GED preparation. A total of 111 lessons are grouped into nine series of instruction, combining traditional question sets and tests with creative multimedia presentations to make the learning process more interactive. This breadth of material makes it easy to tailor the coursework to each student’s individual needs. Vision & Goals is an exercise that Koba developed to supplement its academic offerings. Vision & Goals encourages our resident students to set long-term goals by thinking ahead to the employment opportunities that are open to them in adulthood. Students look at many different jobs and careers, thinking about which one(s) they would like to pursue. They then research in-depth information about one of the chosen jobs: required education level, needed skills and abilities, duties and responsibilities, working conditions, potential salary. They are also encouraged to set a goal date for when they would like to be working in the field they have chosen. Some of the jobs our students have envisioned for themselves include police officer, graphic designer, veterinary assistant, professional chef, social worker, lawyer, and service in the armed forces. A number of the residents in the Mansion at Focus Point group homes remain enrolled in the local public school system. Although they do not participate in the AAA’s alternative diploma or GED program, many of them have experienced their own difficulties in mastering what they are learning in school. We come alongside them to help them achieve academic success without dropping out of public school. One of the most important supplemental resources we offer is COSMEO, the award-winning online tutorial program developed by Discovery Communications and the Discovery Channel. COSMEO is an invaluable resource. Not only does it provide academic assistance across the full range of necessary subjects, but it actually uses exactly the same materials as the local public school system. This is probably why it is the most widely used educational video streaming service used in American schools. For direct instruction in groups, Cosmeo offers videos, pictures, articles and web links covering the full spectrum of academic coursework. Students who are in need of individual remediation or enrichment can take advantage of Cosmeo’s resources in order to conduct research, view instructional videos, or play educational games that help to enhance specific skills (e.g. vocabulary building or math computation ability). Denise* came to the Mansion when she was 19. She had a history of bipolar disorder, which had led to incidents of aggression, assault, and truancy from school. Denise found the group home to be a calm and reassuring environment. She had very few instances of aggression with peers or staff persons, and was able to adapt to the milieu with no medications. Having entirely given up on pursuing a high school diploma or G.E.D. Rochelle entered the AAA with strong reservations. The alternative diploma program was perfect for Denise. She was able to study at her own pace, spending extra time and receiving one-to-one tutoring with Mansion counselors in the subjects that gave her the most difficulty. Although there were several days when she appeared so frustrated that would quit, she heeded the constant encouragement from Mansion staff and persevered. Eight months after she came to the Mansion, Denise graduated from the Academy with a high school diploma. Having successfully managed her mood disorder and academic difficulties, Rochelle was successfully discharged to a program for the support of Independent Living Skills. Jamal* was admitted to a Mansion group home at the age of 16. He had been removed from his biological parents at the age of 5, after having been abused by a friend of his mother. Placed in a number of different residential settings over the years, he nevertheless maintained a strong bond with his mother and would frequently leave on his own to return to his mother’s home. Because he had had so little residential stability, Jamal’s school attendance and performance was generally poor. With little motivation to return to a structured school setting, Jamal was enrolled in the AAA shortly after coming to the Mansion. At an individualized pace, with encouragement and tutoring assistance from MFP counselors, Jamal steadily progressed through the alternative diploma program. Six months after entering the program, Jamal suffered the sudden and tragic death of his father. 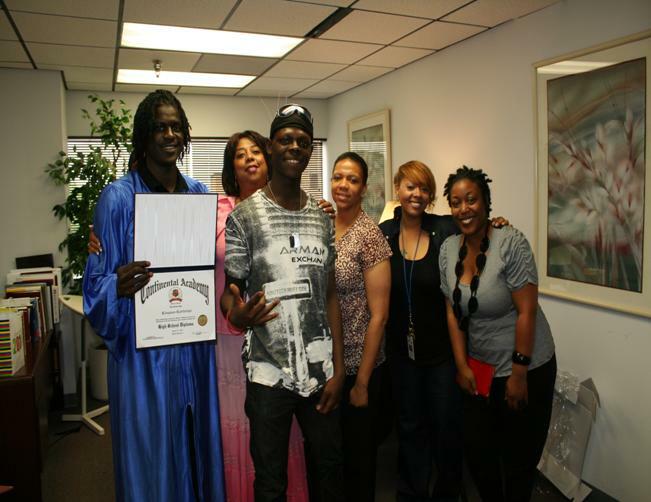 Rather than discourage him, this event seemed to galvanize Jamal both to complete his high school diploma, which he completed within two months of his father’s death, and to strengthen his relationship with his mother even further. These are two shining examples of the residents whom we have helped achieve educational successes they thought would never be within their reach. Students in the AAA are initially motivated by the monetary rewards. However, each student has listed “getting a high school degree” as his or her ultimate priority and this soon becomes as strong a sustaining motivation as the money. In short, our students see that it is possible, and they work even harder to reach this all-important first step on the adult education ladder. Out of all the counseling, therapy and other methodologies we have employed over the years to help residents turn their lives around, nothing has had a greater impact than seeing the future open up for them by earning a high school diploma. But we do not stop with graduation. As the completion of the GED or alternative diploma program approaches, we start them on the “Next Step,” which emphasizes planning for the next phase of their lives – whether college, junior college, the military or vocational school. *Students’ names have been changed.